I’ve never been rafting. What should I expect? Whitewater rafting is a physically demanding activity. Participation is required. You do not have to be an athlete, but good physical condition is expected. If you have any medical condition that you feel will hinder your ability to participate, consult your physician. Everyone will be wearing a US Coast Guard approved life preserver (limited to a maximum girth of 54 inches). You do not have to have strong swimming skills. However, all participants should be comfortable in and around water, especially on our more advanced tours. 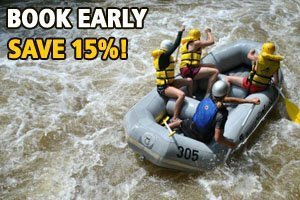 Going for a swim is always a possibility on a whitewater rafting tour. Your guides will brief you on what to expect and how to behave in the event that you fall out of your raft. Keep in mind, the likelihood of falling out of your raft increases as the river class increases. ← What is included in the price of the tour?